Well, it has been a very hectic pre-Christmas. I was sick for a week and it kept hanging on ever since. Not much got done. Christmas Eve and it is finally done! HAHAHA!!!! I love this time of year, we are all in it together. Here are some pictures of our home all decorated for the holidays. The tree and some of the living room. We have used these ornaments for the last 36 years, all unbreakable. The glass ones don't get put up because we don't have the room to display them where people won't knock into them. The edge of my computer desk has a small display. 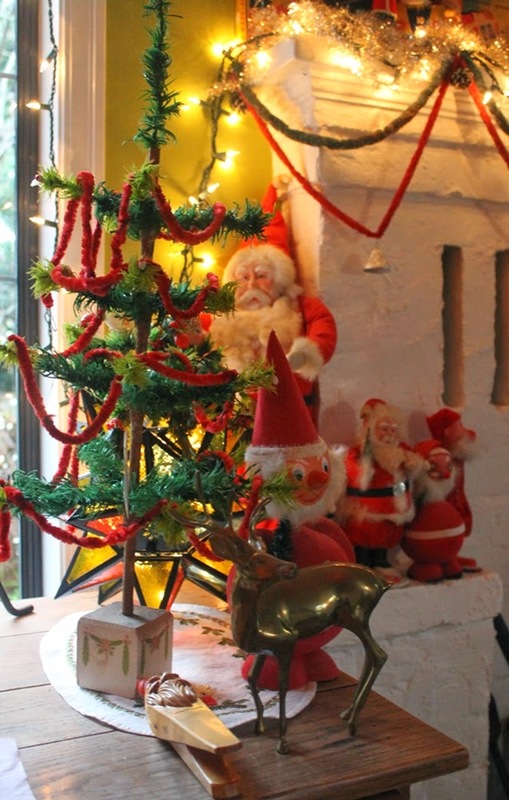 you can see some of my vintage Santas in behind behind. We usually put a village on the buffet but this year I wanted to do something a little simpler and totally different. I found an ice scene table runner with polar bears on it so that set the theme of a winter snow scene. Christmas Day all of the bowls will be filled with cookies and the snow scene cake stand will have tarts and cookies on it. The top shelf of the buffet aways has this antique chromolithographed nativity scene. After all if it wasn't for the birth of Jesus Christ there wouldn't be any holiday to celebrate. 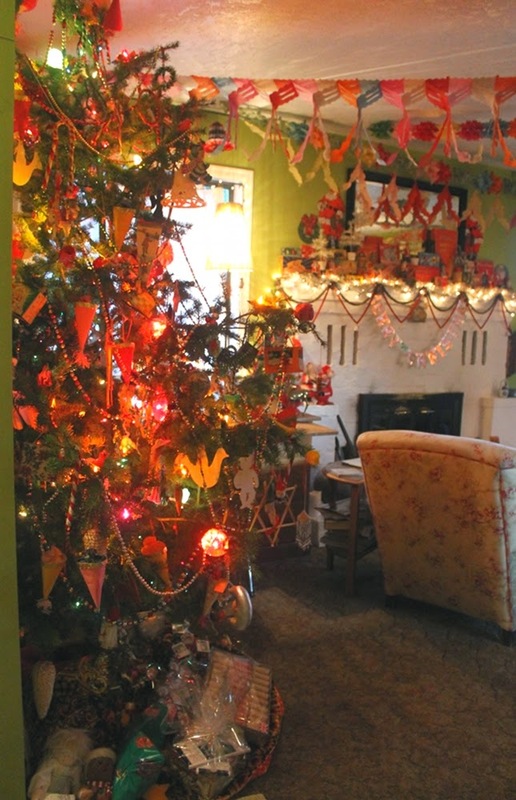 The tree on the left is decorated with celluloid ornaments and the tree on the right is decorated with chenille Santas, candy canes, and all sorts of chenille figures. 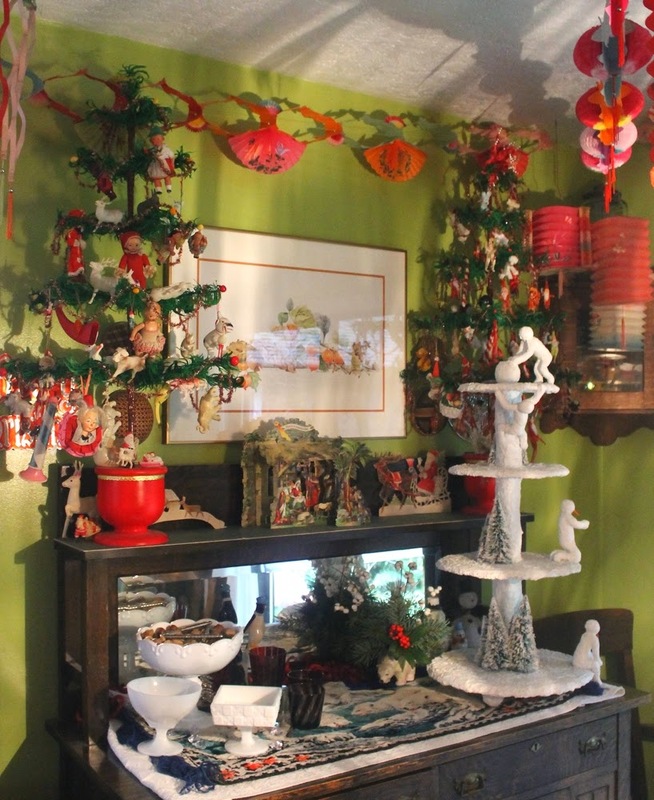 Every year we cover the ceiling with vintage Chinese and Japanese lanterns and garlands. 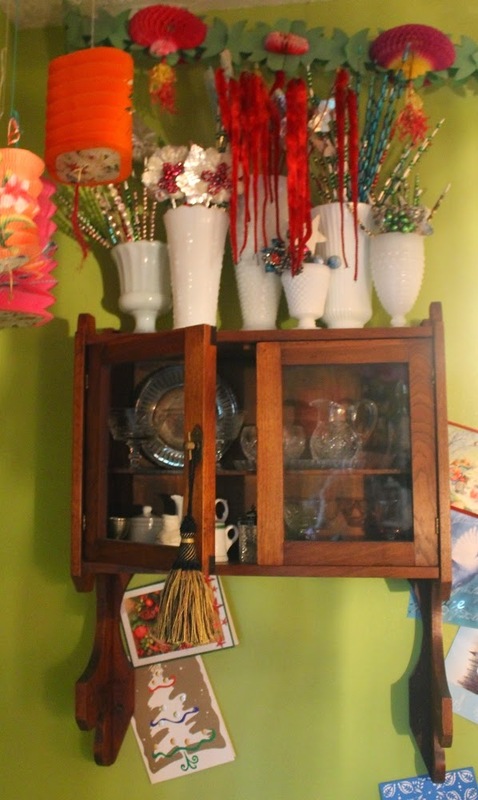 Finally the little china cabinet decorated with milk glass vases filled with vintage glass spikes. Have a wonderful Christmas everyone. I have some other posts that were going to go up before Christmas and never made it so between Boxing Day and New Years Eve I will try to post them.